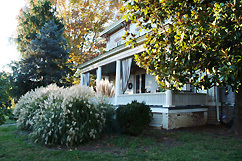 Lackawanna Bed & Breakfast, located in Front Royal, makes it easy for you to experience a wide variety of activities. Canoeing, hiking, fine dining, theatre, wineries and visiting historic sites. Lackawanna (a Delaware Indian word meaning “meeting of the waters”) was built in 1869, by Dorastus Cone who moved to Front Royal soon after the Civil War. The house was named Lackawanna when it was built; probably because Mr. Cone came here from Lackawanna County, PA, and also because the North and South Fork of the Shenandoah River meet at the end of our road. Mr. Cone along with his partners operated the famous water gristmill, known as Riverton Water Mills on the South Fork of the Shenandoah River. Breakfast at Lackawanna is always a special event. All of the ingredients are personally selected for their freshness and in-season availability. Sandy and Phil attended the Culinary Institute in New York taking classes in gourmet breakfasts and baking and they both enjoy preparing this special meal for their guests. The multi-course breakfast menu changes daily and is served in the dining room between 8:30 and 9:30 with all the fine china and linens becoming to the style and era of this Victorian B&B. We are always happy to accommodate special dietary needs, so please don’t be afraid to mention them to us.